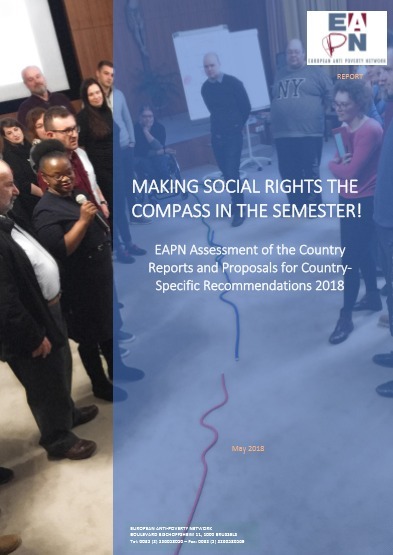 EAPN presents its members’ assessment of the 2018 Country Reports for EU Member States: Make Social Rights the Compass in the Semester! Members looked into to what extent the analysis and recommendations in them impact on poverty and social exclusion, in light of current policy developments in their own countries. The following aspects were also looked into: the mainstreaming of the European Pillar of Social Rights, and the implementation of the 2017 Country-Specific Recommendations (CSRs). On the basis of this assessment, EAPN members’ own proposals for CSRs in 2018 are also presented. Country Reports assess the progress of each Member State in addressing the issues identified in the previous CSRs, including an in-depth review under the Macroeconomic Imbalances Procedure. For Member States with a macro-economic adjustment programme, the Report discusses progress with the implementation of reforms. The Country Reports provide the basis for dialogue with Member States in bilateral meetings and feed into the preparation of National Reform Programmes (as well as Stability / Convergence Programmes), submitted by Member States in April. They also provide a key moment for stakeholder engagement. The European Commission’s Communication on the Country Reports underlines that the European Semester has been “enriched” by the European Pillar of Social Rights to support “renewed convergence of better working and living conditions”. It emphasizes the aim of the Country Reports to monitor 3 dimensions of the Pillar: Equal Opportunities and access to the labour market, Fair working conditions, and Social protection and inclusion. It makes specific reference to key concerns around adequate skills, gender employment gap, rising in-work poverty and low impact of social transfers on poverty reduction and includes boxes on key priorities on sustainable, adequate and effective safety nets, including minimum income. It highlights that the Country Reports also monitor Country-specific Recommendations’ implementation, and trace progress on Europe 2020 targets. However, the overwhelming focus of the Country Reports still primarily appears to be on strengthening the foundations of European economies, based on the ‘virtuous triangle’ of investment, structural reforms and responsible fiscal policies, raising concerns about how far there will be a continued priority given to deficit reductions primarily through austerity measures, directly impacting on poverty and undermining social rights. Positive progress with Social Pillar, but all principles need to be mainstreamed and coherently delivered through whole report. Delivering on Europe 2020 Poverty target must remain a key focus through integrated anti-poverty strategies! Social scoreboard needs better, more timely indicators and must be linked to goals and not just scoreboard averages to avoid downward convergence. More focus needed on universal access to services: affordable social housing, healthcare and gender pay gap and attention to key excluded groups. Missed opportunity to make civil society a key stakeholder and monitor quality of engagement. Prioritize the fight against poverty and social exclusion, through EU and national comprehensive, rights-based integrated anti-poverty strategies, and through comprehensive poverty, social and equality impact assessment. Guarantee universal access to affordable quality services, including healthcare and housing in line with the Social Pillar. Shift the narrative from austerity to social investment in social rights and standards, and finance adequate and sustainable welfare states through tax justice and progressive taxation.